You might be mistaken by the angry in the title as in this post I am actually really happy! The angry however comes from the title of this sweatshirt. This cute but angry bunny first appeared in the Alexander McQueen ‘McQ’ A/W 14 collection and this year it’s back for Pre Spring/Summer 2015. I picked up this McQ sweatshirt on farfetch after I was so excited to have won fashion blogger EpiphannieA giveaway of a £200 voucher! There was so much to choose from but this little guy won a place in my heart. He is very comfy too and great for throwing on, especially in this cold weather when you can layer up with a few thermals underneath. I’ve also just booked tickets to the Alexander McQueen Savage Beauty exhibition at the V&A which starts in March this year, I cannot wait to see it, it looks amazing. 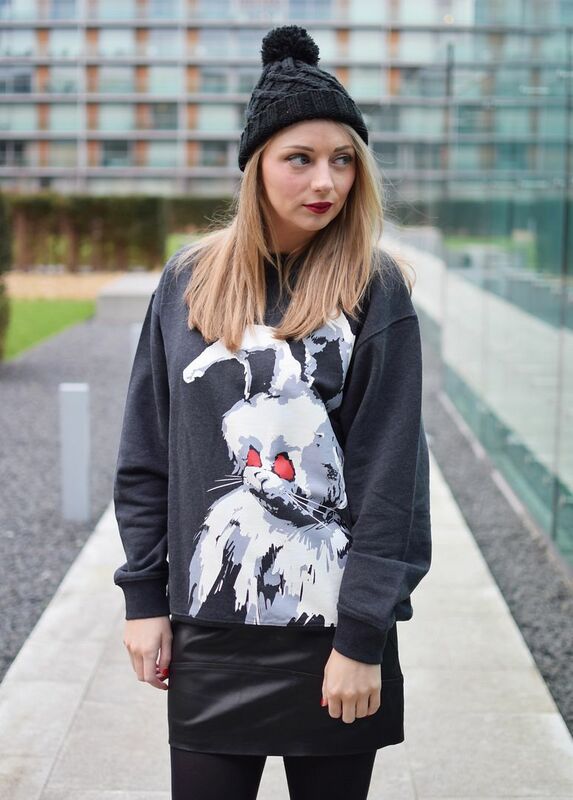 I love the oversized feel of the sweater and the painted on bunny design is very cool. It sort of reminds of the twisted fairytale of the Celebrity Big Brother house at present. Gumtree who sponsor CBB interviewed me this week about my thoughts on the house, take a look over on their blog. With the sweater I am wearing an ASOS leather skirt, I had been looking for a leather skirt for a while and wanted a real leather one compared to pleather, this one is so comfortable and a great fit. You might remember it from my ASAP54 outfit post. I will hopefully get lots of wear from this for day and night, which is great for my new style resolution, have you watched my latest vlog all about it? This is teamed with chunky heeled suede boots from ASOS and also a bobble hat from ASOS. I’m living in hats the past few days, it’s just too cold.